Thank you for your support during this difficult time. Please enhance this tribute to Fred by adding your memories and photos. 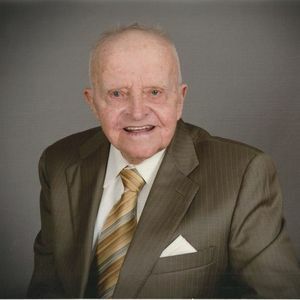 Fred Louis Lutge, Sr., 93, of Charleston, South Carolina, widower of Doris Aultman Lutge entered into eternal rest Tuesday, March 12, 2019. His funeral service will be held Monday, March 18, 2019 in Martin Luther Lutheran Church, 1605 Harbor View Road at 11:00 a.m. Interment, Live Oak Memorial Gardens. The family will receive friends Sunday from 4:00 p.m. until 6:00 p.m. in J. Henry Stuhr, Inc. Downtown Chapel, 232 Calhoun Street. Fred was born September 2, 1925 in Charleston, South Carolina, son of the late Henry F. Lutge and Margaret Gerdes Lutge. He was a first generation immigrant from Germany. He honorably served in the United States Army during WWII and was a retired salesman with Murray Biscuit Company. Fred was a member of the Charleston Elks Lodge #242 and Martin Luther Lutheran Church. Fred is survived by his son, Brian Wade Lutge of Charleston, SC. He was predeceased by his son, Fred Louis Lutge, Jr.; and two brothers: Henry F. Lutge, Jr. and Rudolph W. Lutge, Sr.
Memorials may be made to Martin Luther Lutheran Church, 1605 Harbor View Road, Charleston, SC 29412. Life Stories provides friends and families a forum to post their favorite stories and memories of Fred Louis Lutge, Sr. ensuring the precious experiences are never forgotten. Share joyful times, post a photo that captures the moments you cherish, and allow others to reply, relive and remember.